Introduction: Significant weight regain after gastric bypass can occur over time due to dilatation of the gastric pouch and stoma. Endoluminal approaches for gastric pouch reduction are currently under investigation. EndoFLIP® (Crospon Ltd., Dangan, Galway, Ireland) is an endoscopic functional imaging probe designed to accurately measure intraluminal volume and wall compliance. 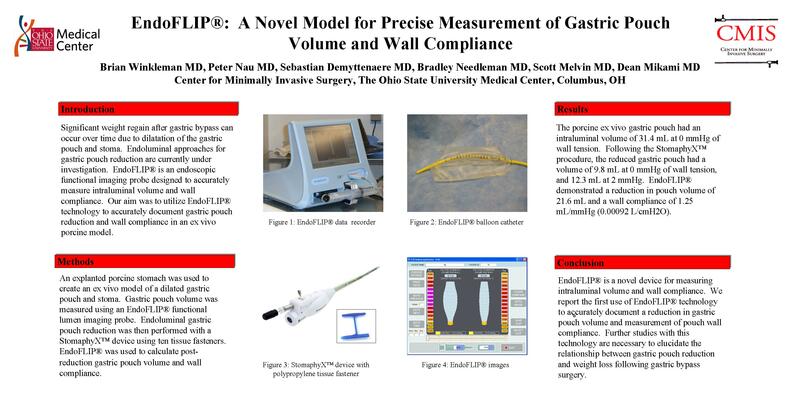 Our objective was to utilize EndoFLIP® technology to accurately document gastric pouch reduction and wall compliance in an ex vivo porcine model. Methods: An explanted porcine stomach was used to create an ex vivo model of a dilated gastric pouch and stoma. Gastric pouch volume was measured using an EndoFLIP® functional lumen imaging probe. Endoluminal gastric pouch reduction was then performed with a StomaphyX™ device using ten tissue fasteners. EndoFLIP® was used to calculate post-reduction gastric pouch volume and wall compliance. Results: The porcine ex vivo gastric pouch had an intraluminal volume of 31.4 mL at 0 mmHg of wall tension. Following the StomaphyX™ procedure, the reduced gastric pouch had a volume of 9.8 mL at 0 mmHg of wall tension, and 12.3 mL at 2 mmHg of wall tesion. EndoFLIP® demonstrated a reduction in gastric pouch volume of 21.6 mL and a wall compliance of 1.25 mL/mmHg (0.00092 L/cmH2O). Conclusions: EndoFLIP® is a novel device for measuring intraluminal volume and wall compliance. We report the first use of EndoFLIP® technology to accurately document a reduction in gastric pouch volume and measurement of pouch wall compliance. Further studies with this technology are ongoing and may elucidate the relationship between gastric pouch reduction and weight loss following gastric bypass surgery.